This weekend, with the predictions that we’d get hit with a mega snowstorm, I decided to use the housebound time as an opportunity to henna my hair. I’ve been using Lush’s Henna Hair Dye for a couple of years now because I was curious about the “all natural” method of coloring my hair after years of conventional home dyes. Unlike chemical dyes, which, from my understanding, rip open your hair follicle and replace your natural color with a dye, henna actually slowly permeates your follicles while sealing them. 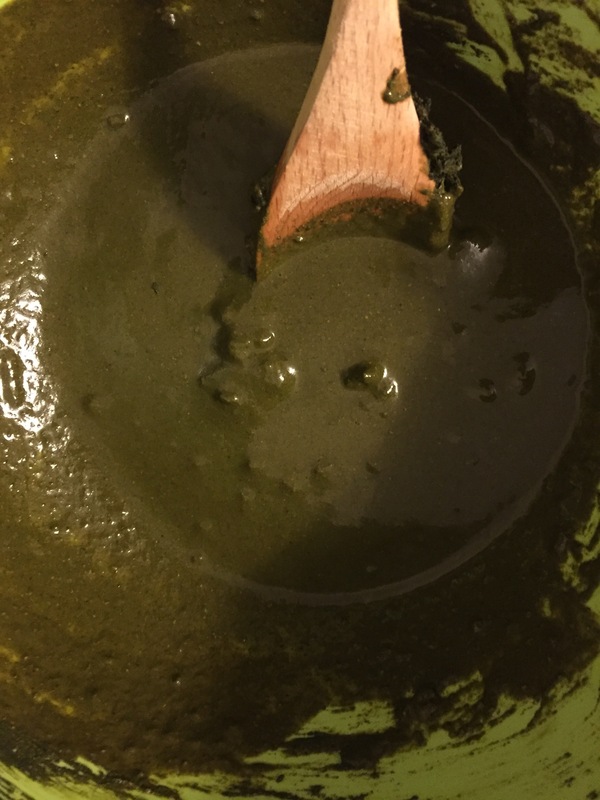 While chemical dyes can leave your hair brittle and weak from this damaging process, henna is restorative and healthy. A few years ago, I started with Lush’s “caca marron” (yeah, weird name, I know), which boasted that it dyed hair a “deep chestnut.” I always ended up a redhead, along the lines of Emma Stone. Recently though, I’ve wanted something darker, so I tried “caca brun,” which gives me the right deep and dark brown that I want in the fall/winter months. Not pictured, but also needed: boiling water and hair clips. 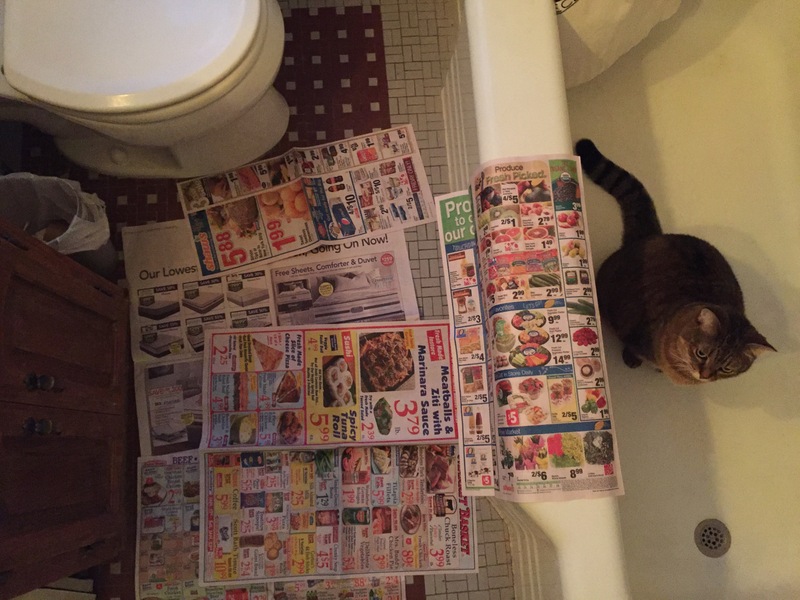 Step 1: Lay out newpaper (or grocery ads, whatever) all across your bathroom floor and in your sink. Henna gets MESSY! 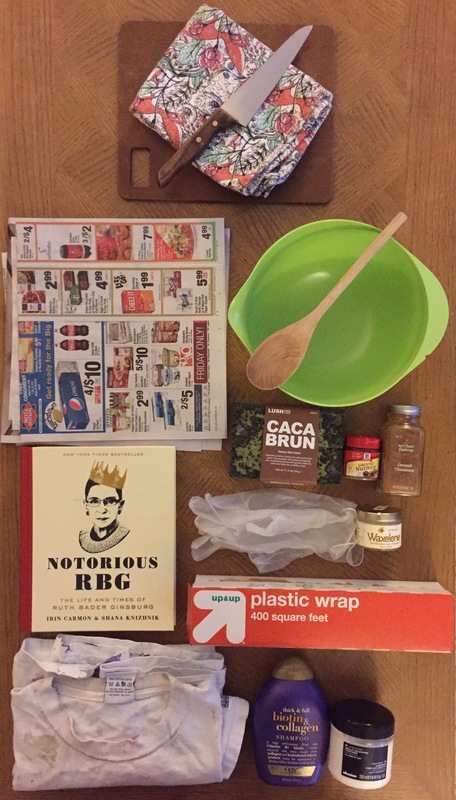 Step 2: Unwrap your brick and cut it up. I put the dish towel over the knife back because the bricks are hard to cut. The bricks are actually lined so you can easily cut your brick into six squares. I cut the block down to squares, portion out what I need, bag the remainder in a Ziploc, and chop what I’ll use into smaller bits. Because I have shoulder length hair, I use about two squares. The Lush employees initially suggested I use more (like three or four squares), but I find that I have too much product left over. Plus I’m cheap and like to squeeze as many dyes as I can out of one $27 brick! You’ll notice some weird powder in this photo: it’s cinnamon and cloves! I read that cinnamon, cloves and coffee will increase the brown color, while paprika or red wine will increase the red. Feel free to experiment (just do so in moderation the first few times you henna so you get a sense of color). I used about a teaspoon of cinnamon and a half-teaspoon of cloves. Step 3: Add just-under-boiling water. You want the water hot enough to mix and melt the henna chunks, but not enough to burn your head. You also want enough water that you’ll get a fair smooth paste: not thick and dry, nor watery and runny. 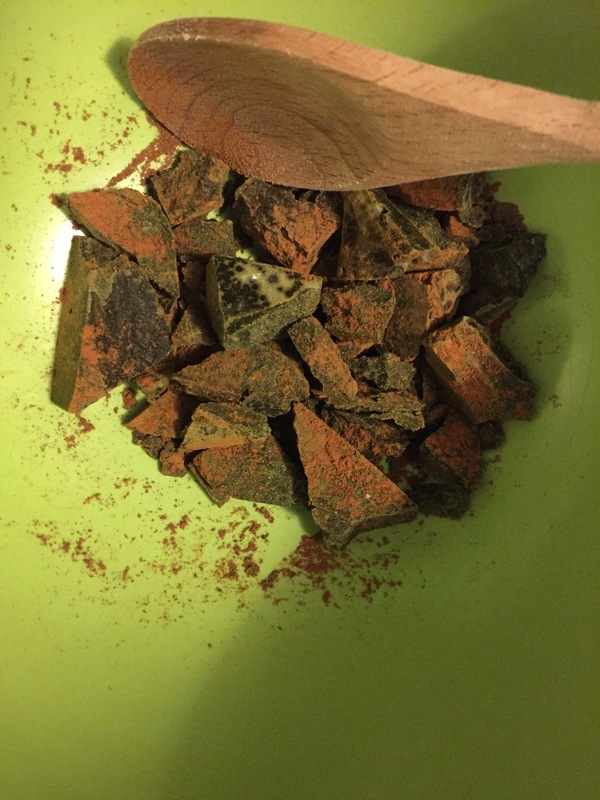 Step 4: Mix and break up the henna chunks. My mix ended looking like this, kind of like batter, with some chunks of henna in it, but fairly smooth overall. Step 5: Head the bathroom with that bad boy mix! Make sure any cats are out of there before application because you don’t need a henna-ed feline. I nestle my bowl in my bathroom sink. Step 6: Pin your hair up in segments. I leave the lower half of my hair — below my ears and by my nape — down because I’ll start with that section first. I pin the upper part of my hair — at the crown of my head — because I’ll work up that area last. It’s easier to do the hardest parts of your hair and head first because you’re essentially applying impenetrable mud to yourself. Step 7: Apply your Vaseline, Waxelene, or Ultrabalm all along your hair line. That includes your forehead, in and behind your ears and at the nape of your neck. It’s ok if a little gets in the random strands of your hair. This is to protect your skin from getting tinged any weird shades of red or brown. Step 8: Put on your gloves. Step 9: Take a big ole glop of henna from your bow; I used my hands, but you could probably try a brush of some sort. Apply said glop to the lowest part of your hair, that bit that’s hanging down at your nape. Pretty much, you want to take the henna and apply/rub/mush into your hair from your roots to ends. Apply until that section is saturated. I take each glopy section, twist it, and press it to my scalp. The henna paste works like a strong enough adhesive to make that twist stick to my head. Step 10: When the lower half is done, take down another section that you’ve pinned up and apply the henna as you did to the lower section by applying, rubbing, and mushing. Twist and stick to your head if you can. Finish with the final section in the same manner. Step 11: When you’ve finished all the sections, apply any extra henna to your head as a general covering. I pretty mush make a henna helmet. Step 12: Remove your gloves carefully. Step 13: Very carefully, take your roll of plastic wrap and wrap your entire henna-ed scalp in plastic. It make take several passes, but cover everything. I always end up going a couple of inches below my hair line at my nape and over my ears. You won’t be pretty, but it’ll help from getting henna EVERYWHERE while you let it cure. I made a time lapse video of steps 6 through 13. It’s about 40 seconds, but I think it took me approximately 25 minutes from applying the Waxelene to plastic wrapping. Remember: I’ve done this a few times, so your first attempt may not be as quick or as easy. Step 14: I always get henna down my shirt so I stand in the shower to remove my henna-ing shirt, wipe any excess off, and maybe put on another crummy shirt for the wait. Step 15: Wait for two to four hours. (I know — forever!). I like to use this time to read a book, watch some Netflix, and drink a glass of wine. Step 16: Shower time. I try to rinse as much crud (because it will feel like this) out of my hair first, usually by turning my head upside down in the shower. Then I shampoo, which releases a lot of the henna. Then I condition — sometime twice — until I feel all of the product is out. Step 18: Enjoy your new hue! Is this a super intense way to dye hair? You betcha! Why would on earth would I spend 3-4 hours on this process when I could easily go to salon and/or home dye in a third of that time?! First, the color lasts a lot longer I find; any time I’ve chemically dyed my hair this shade of brown, it turns red in two weeks. This color will last me about four to six. Second, my hair feels so much healthier with henna than chemical dye — softer, smoother. Three, I love the more natural color because my highlights come through my predominantly this way and it fades naturally too, instead of that weird root landing strip effect. Four, I like to have this time to pamper myself (henna nights are also my pluck-and-wax-random-hair/shave-and-lotion-leg/use-my-most-expensive-face-mask all while drinking wine nights). This ain’t for everyone, but I like it! Thank you so much for this tutorial! I have heard of henna but I never heard how to actually do it, this was so helpful. The color came out beautiful!